I've never been one to admire celebrity women, I rarely read magazines these days unless there is a free gift with purchase and if you asked me which celebrity would play me in a movie of my life I'd be hard pressed to tell you. There are of course celebrities I like in TV shows and there are some I occasionally tweet I'd like to be. I think it is the character they play rather than there real life selves. For quite a while my girl crushes have been Zoe Hart - Rachel Bilson. I've loved Rachel ever since she was Summer Roberts in The OC. I like her style and that may be the style given to her by a wardrobe department but all the same I could see me in similar outfits. 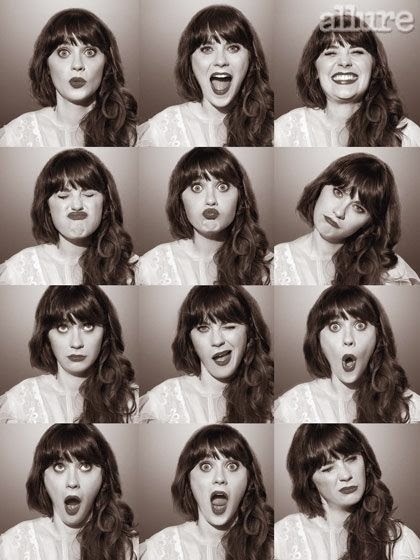 Another Fictional person I would love to be is Jess - Zooey Deschanel. She is funny, smart, Kooky, adorable and has some amazing dresses. I have planned an outfit to go with this post but I haven't had the confidence to wear it as it's a bit too dressy for work and I haven't been anywhere that warrants a nice outfit just yet. Zooey and Rachel, Zoe and Jess are my fave celebs of the moment. My conclusion was drawn when I re-installed my pinterest app and set up a board Magnificent 7th Inspiration and I only pinned pictures of these two. Which celebs style would you like to steal, have, borrow inspiration from?